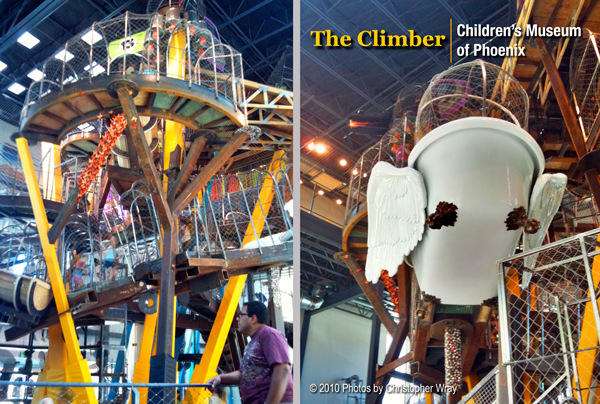 If you’re traveling in the Phoenix/Scottsdale area, be sure to visit the Children’s Museum of Phoenix. Housed in the historic Monroe School building (a great example of Classical Revival architecture), the Children’s Museum features three floors of incredible sensory and motor stimulation. Their latest installation, dubbed The Climber, is a 37-foot high, 50-ton conglomeration of structural steel, fiberglass, wood, stainless steel aircraft cable, and found objects. My kids loved this wholly whimsical and totally hands- (and feet-) on installation. “Now this is the ultimate treehouse,” enthusiastically commented my son before dashing up one of its numerous gangways. The structure is thoughtfully constructed with a third-floor observation deck that permits visitors with limited mobility (or just too pooped to continue climbing) to observe the multi-level terrain of The Climber. Clamber, balance, maneuver and discover — The Climber will engage your mind and muscles! Don’t miss it. — Photos were taken with iPhone 3GS camera and Pro HDR app.